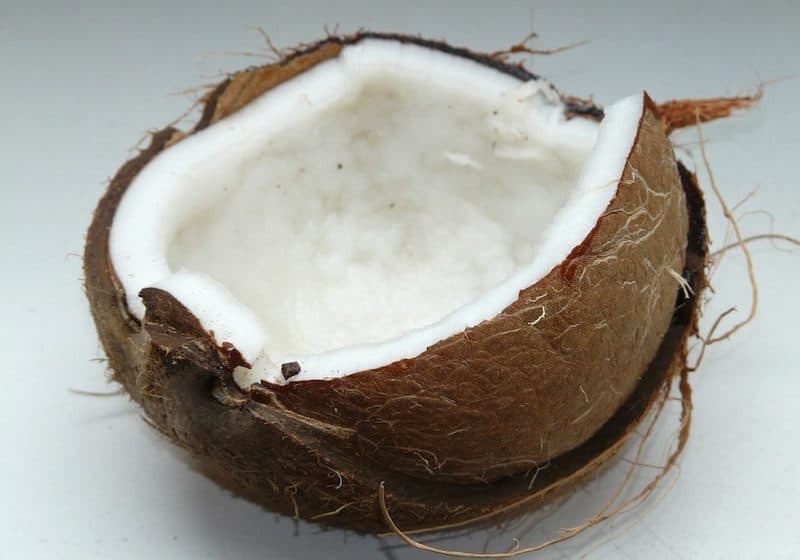 15 Whole30 Recipes With Coconut Milk: Go Nuts for Creamy Coconuts! 15 Whole30 Recipes With Coconut Milk: Go Nuts for Creamy Coconut Milk! Coconut milk is highly nutritious and intensely creamy, thanks to its rich fat content. A staple for Whole30 eaters, it can be used in many exciting and exotic recipes (not to mention it’s great for brightening up black coffee on Whole30 without cream). We have put together an excellent collection of 15 Whole30 compliant recipes featuring coconut milk as a main ingredient – check them out! Farmstead Chic brought us a Whole30 approved beverage recipe. This Paleo & Whole30 Mocha Latte has coffee, coconut milk, cocoa powder, and vanilla powder. Enjoy this rich and creamy mocha latte with your breakfast! Looking for something zesty and citrusy? A Saucy Kitchen shares a recipe called Coconut Lime Chicken! Give it a try using chicken breasts, coconut oil, lime, arrowroot starch, and full-fat coconut milk. Luscious and refreshing, this chicken makes a great summer entree. If you’re looking for a dairy-free butter chicken recipe, then look no further! This Indian (No) Butter Chicken recipe uses coconut oil, coconut milk, coconut cream, chicken broth, tomato paste, and Garam Masala. Impress your guests with this vibrant looking dish! Savory Tooth has crafted an easy Whole30 compliant curry chicken recipe. This Chicken Skillet with Coconut Milk Curry is made with chicken breasts, baby spinach, coconut milk, curry powder, and Sriracha. Curry and coconut flavors blend for a brilliant dish! Traditional Thai recipes are absolutely tasty but not usually Whole30 friendly. Food Faith Fitness made a Whole30 approved Thai Pineapple Paleo Chicken Curry with Coconut Milk using ingredients including coconut oil, chicken breast, broccoli, coconut milk, yellow curry paste, and pineapple. Try this curry recipe the next time you want a sweet and savory combo! Who knew coconut milk would be the featured ingredient in this delicious Indian recipe? My Natural Family creates Indian Chicken Korma Coconut Milk using cashews, shredded coconut, coconut milk, coconut oil, chicken thighs and Garam Masala. Simply divine! This Whole30 Zuppa Toscana recipe combines beef tallow, Italian sausage, chicken broth, red potatoes, and full-fat coconut milk. Switch up your flavor profile with this Italian classic from Farmstead Chic! Physical Kitchness offers a mind-blowing recipe for Tomato Basil Bisque with Italian Meatballs. Tomatoes, basil, full-fat coconut milk, ground beef, and dried oregano make up this earthy and hearty dish! Lemongrass Coconut Milk Mussels taste as vibrant as they look! This recipe is a great addition to your dinner table! Paleohacks combines common ingredients with spring onions, lemongrass, coconut milk, and fresh mussels. It’s a great way to get your seafood fix! Does your soup need a Mexican flare? 40 Aprons creates a simple recipe for Whole30 Instant Pot Chicken Tortilla-Less Soup. This dish calls for chicken breasts, green chiles, zucchini, full-fat coconut milk, avocado, and coconut cream. Add more spice in your broth to give it an extra kick! This recipe for Thai Coconut Soup comes from A Clean Plate. With coconut oil, mushrooms, full-fat coconut milk, and broccoli, you’ll experience a mouthwatering madness! Satisfy your soup cravings with this Roasted Butternut Squash Soup recipe from Stupid Easy Paleo! This recipe is made with ghee, butternut squash, carrots, chicken broth, and full-fat coconut milk. This good looking and great tasting soup will surely take your breath away! Frittata on Whole30? Sunkissed Kitchen found a way with this recipe for Whole30 Frittata with a Potato Crust. This frittata has russet potatoes, eggs, full-fat coconut milk, fresh dill, smoked salmon, and asparagus. Serve this as a wholesome meal for your family! The Forked Spoon has formulated an incredible recipe for Pineapple Cashew Cauliflower Rice with Coconut Milk. Coconut oil, cauliflower, full-fat coconut milk, pineapple, and cashews make up this sweet and sour ‘rice’. Here is a foolproof recipe for Coconut Lime Cauliflower Rice from the Diet Hood. This dish calls for cauliflower, extra virgin olive oil, onion, garlic, light coconut milk, and lime. Enjoy this twist on cauliflower with this quick and easy recipe! That concludes our list of 15 Whole30 coconut milk recipes. Did we miss any of your favorites? Share your top dishes in the comments below!